Parents trust that a playground is safe for their children. When playground equipment or grounds are not properly maintained, children can suffer serious injuries. Schedule a consultation with an attorney at our firm to discuss your case and learn more about your options for compensation. Like other types of structures, national standards exist concerning playground safety. Did the playground equipment meet these standards? 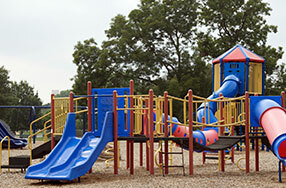 Our firm will investigate how your child was injured and whether the playground equipment violated national standards. At Kraft Davies, PLLC, our Seattle playground injury lawyers have experience helping injured clients as they fight to recover compensation through a personal injury lawsuit. We understand the stress and worry that can come from seeing your child get injured on playground equipment you believed to be safe. Our knowledge of the legal system and our thorough understanding of industry standards for safety can guide our clients to a successful resolution. Injuries can result from defective equipment, defective play surfaces or unsafe surfaces. After we accept your case, our lawyers will immediately investigate all aspects of the accident. Does the playground have a history of children being injured? Are any of the playground toys or equipment currently being recalled by the manufacturer? Was the playground equipment assembled in the proper fashion? With answers to all of these questions in place, we can develop a unique and effective case strategy. Do not hesitate to contact our firm to schedule a consultation with an experienced lawyer. We will provide legal advice and representation regarding the best course of action for your case. For more information or to schedule an appointment with an experienced personal injury lawyer regarding playground accidents, please contact us.